Open to anyone experiencing ongoing health challenges. Please contact MaryEllen Hopfe, RN for more information. Whether it is a few days in the hospital, a couple of weeks in transitional rehab or a long-term home-bound situation, together with the pastoral staff, we coordinate visits to Faith friends and members in order to offer friendship, hope, encouragement and at times advocacy. Jesus did it. “But Jesus often withdrew to lonely places and prayed.” (Luke 5:16) He taught us how to do it with the Lord’s Prayer. (Matthew 6: 9-13) We are instructed to be about it at all times. “Pray continually.” (1 Thessalonians 5: 17) Prayer is of utmost importance. Prayerrequest@4fcc.org is our e-Prayer ‘hot line.” Requests sent to this address are distributed daily (and in urgent situation, immediately) to hundreds within our church family who are committed to prayer. From this list and other sources, a weekly prayer sheet is prepared and sent out on Fridays and is available in printed form each Sunday. Once a month—usually the third Sunday of the month—we have a dedicated time during Sunday worship for Prayer & Anointing, when church leaders are available to pray for any concern. When the sick and shut-ins find it difficult to get themselves to church or to needed medical appointments, we do our best to find a ride for them. 2) On the second Sunday of Advent, a service of remembrance is incorporated into our Sunday worship. This confidential group offers support for any woman who has experienced abuse as a child or an adult. Abuse can be sexual, emotional, physical. In SHOUT we read study materials, process what we are learning, and discover that we are not alone. Others have taken this same journey and they understand our struggles. As we reach out to God, He offers healing and empowerment that goes far beyond what we could accomplish without His help. 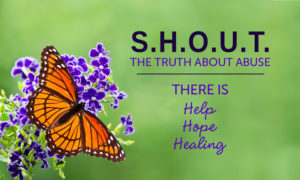 CALL Sheri Fornell 734-536-7131 or send email to sfornell@twmi.rr.com to learn more about S.H.O.U.T. All calls are completely confidential. Offering a flu shot clinic in the fall and periodical CPR training are two tangible ways we work to address health care needs in our church. We have sponsored Blood Drives, as well, but currently encourage our members and friends to give through the local Red Cross and numerous other drives in our immediate area. The Prayer Shawl Ministry is in need of more prayer shawls. If you are able to make one, please consider picking up your knitting needles or crochet hook and making a shawl. Yarn is available. Someone will truly be blessed by your efforts. Questions, contact Nancy Lewis @ nanjl45@gmail.com . Though much of our world of communications has shifted to digital means, we still find that a card of greeting, love, and concern from the church family via the US Postal Service is still a very welcome means of care. We deliver! At least twice a year—in the Advent and Easter seasons, poinsettias or flowers are brought to sick and shut-ins by Congregational Care representatives. Fresh flowers may also be provided by Faith members and friends to beautify the Worship Space on a Sunday morning, after which such friends are welcome to bring the flowers home, or have them delivered to sick or shut-ins. Check with the church office if you wish to provide flowers.